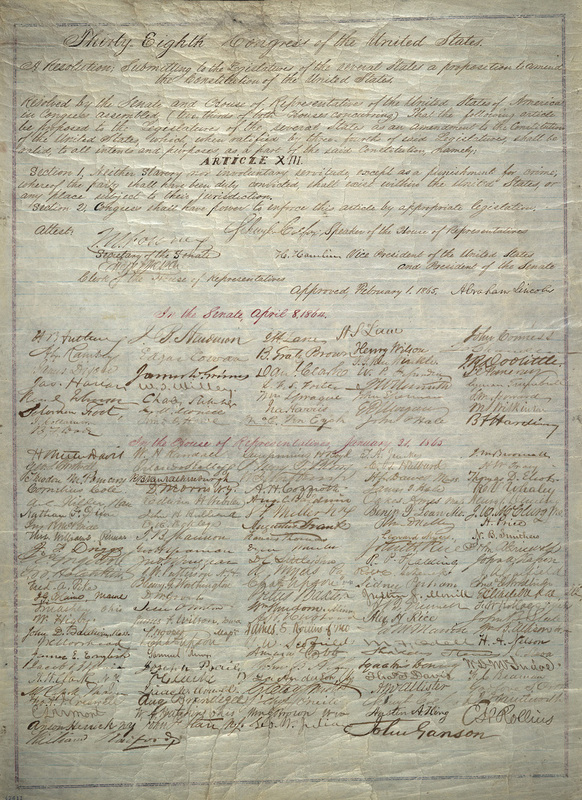 Ceremonial copy of the Thirteenth Amendment [signed by Abraham Lincoln and members of Congress], February 1, 1865, Abraham Lincoln Papers, Manuscript Division, courtesy of the Library of Congress. Unit One: Giving Meaning to Freedom introduces the complex negotiations and volatile tensions between former slaves, former slaveholders, and poor whites that emerged after the end of the U.S. Civil War and the ratification of the Thirteenth Amendment that freed all slaves in the United States in 1865. The Unit One educational documents listed on the left feature excerpts of various primary source documents and first hand accounts that provide in depth insights into these early negotiations in North and South Carolina at the beginning of Reconstruction.